Mai's Vietnamese Kitchen in Bellbowrie Shopping Plaza serves real Vietnamese food in the Western suburbs of Brisbane. Food includes: bread rolls, rice paper rolls and rice dishes. 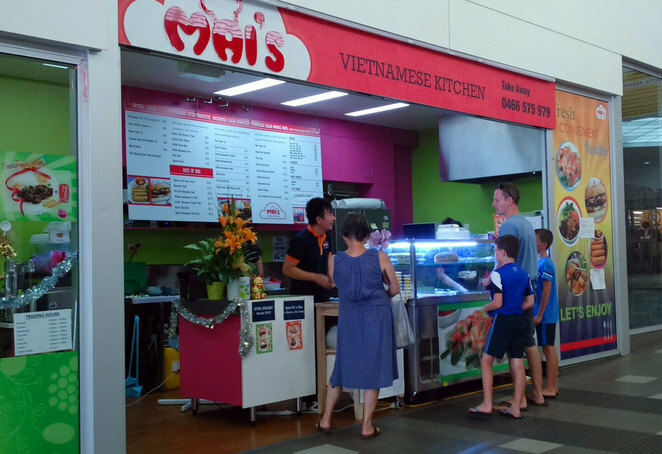 Vietnamese food is taking Brisbane by storm. But if you don't live near the city, or in one the Vietnamese neighbourhoods, you are usually out of luck. Luckily, Vietnamese restaurants are moving to new locations to serve real Vietnamese food to those who love it, and those who will learn how great it is. Banh Mi: Takes French baguettes and adds Vietnamese meat, vegetables and flavours. Chilli is optional, but not if you are Vietnamese. Rice paper rolls: Made fresh, these are very healthy. Prawns are my favourite, but there is also chicken, duck, pork, beef and tofu. Rice in a box: Delicious Vietnamese dishes with rice. Noodle salad bowl: Vietnamese rice noodles and salad. What a great combination on a hot day. Not to everyone's taste because of the strong Vietnamese flavours, but worth trying. On behalf of Mai's Vietnamese Kitchen team, I would like to thank you for this lovely article about our shop. Your work is not only very meaningful to us but also to the locals. I also would like to show our appreciation to our customers who have been supporting and loving us since the first day we opened. We truly hope there are going to be more people who are interested in Vietnamese Cuisine and cultures.